SharePoint 2013 introduced a new functionality called "Geolocation" as a Field type to enable location based data in SharePoint lists. So with GeoLocation field, we can bring "Map" experience to the users. Geolocation Field type is not enabled by default. We have to do few configurations to make it available in SharePoint 2013. 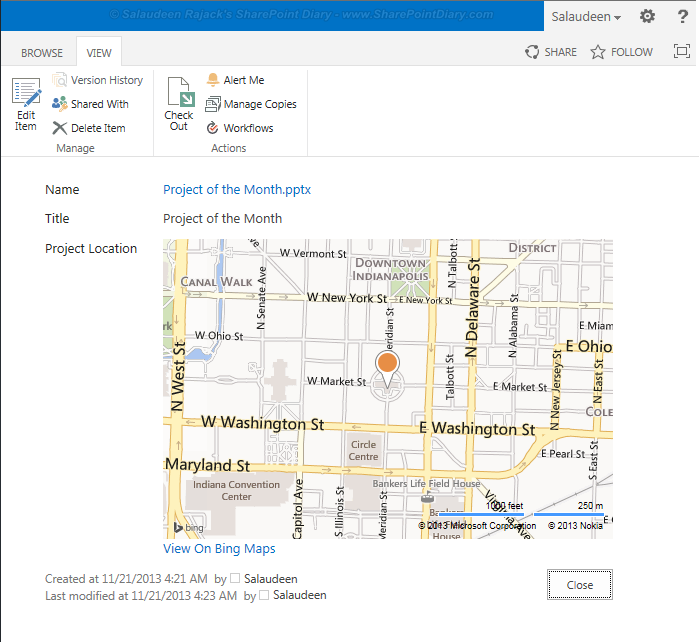 Add GeoLocation column to SharePoint site/list Programmatically. 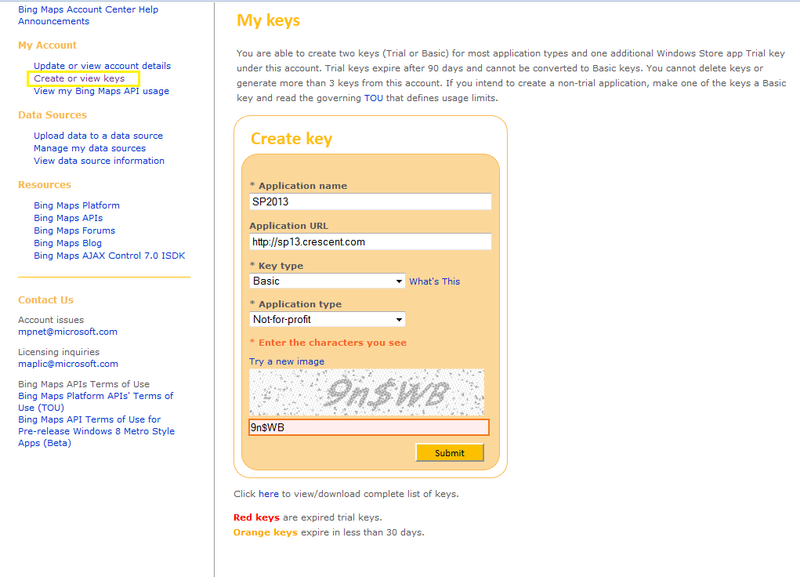 Step 1: Get a Bing map key Obtain a Bing map key by registering at: https://www.bingmapsportal.com. In my case, Here is what I've created by clicking "Create or View Keys". 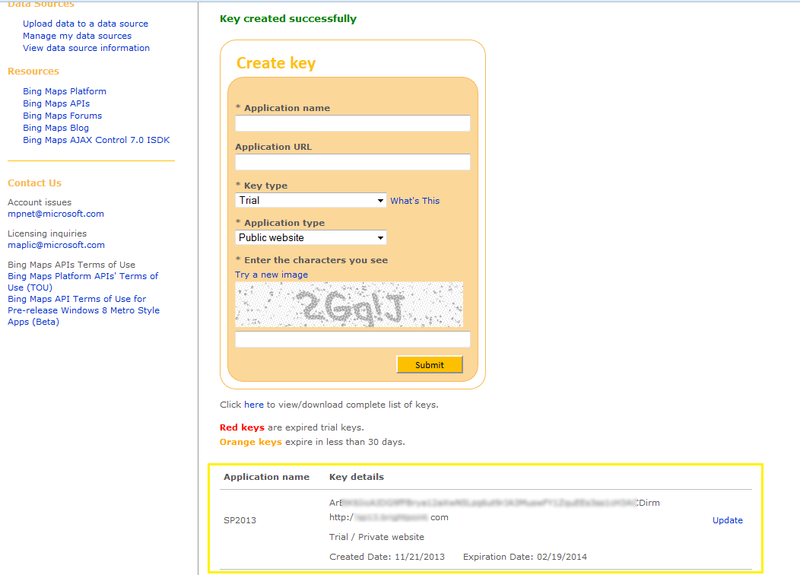 On clicking Submit, you'll get a message "Key created successfully" with Keys listed below the form. Set-SPBingMapsKey –BingKey "<Bing Maps key obtained>"
This sets Bing API Key at the farm level. Its also possible to set Bing map key at Web Application Level. 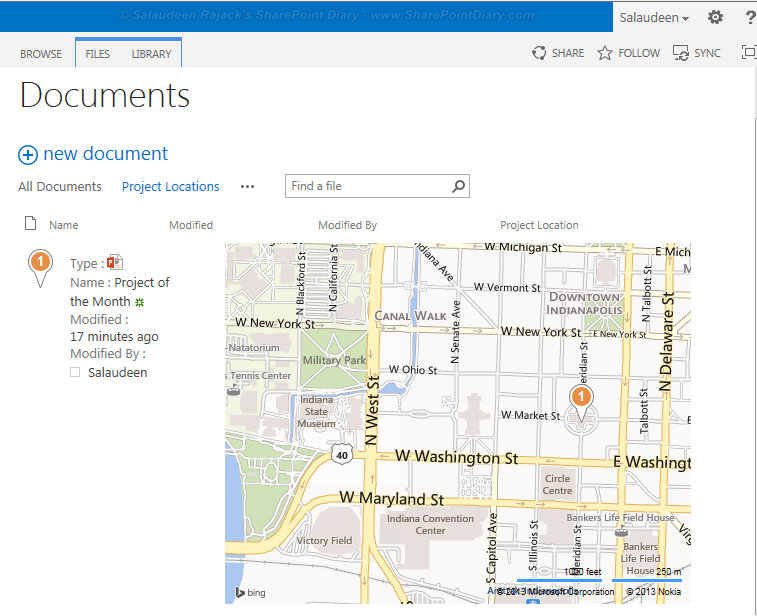 Unfortunately, There is no UI way to add Geolocation column to SharePoint site or List! So, Lets do it programmatically using PowerShell. $fieldXml = "<Field Type='Geolocation' DisplayName='Location' />"
This adds "Location" field to the provided SharePoint web. You can Navigate to List settings >> Add from Existing columns and then Select "Location" column under Custom columns group. #SharePoint Site URL and List name parameters. $fieldXml = "<Field Type='Geolocation' DisplayName='Project Location' />"
Now, You can enter locations either by Providing Latitude-Longitude coordinates or based on current location. On clicking "Use My Location" link, SharePoint automatically sets the location based on your IP! and the Geolocation field in action! Geolocation functionality also provides an another feature: Map View, which gives map layout for the locations tagged. Just create a new view for your list/library >> Choose "Map View"
To add Geo-location column to SharePoint Online, refer: How to Add Geo-location (Bing Maps) Field to SharePoint Online List using PowerShell?